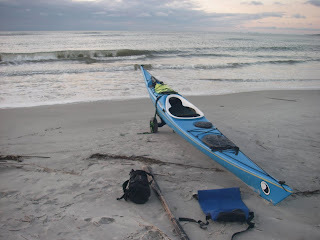 Funny enough, we will not end the year on the water, but will begin 2010 with a New Year's paddle to Little Tybee. The forecast is for a 45' air temp, and a 64' water temp, so it will be a steamy 'Polar Plunge' at the beach on Friday. It has been an interesting ten years.. which for us started out in a canoe with all our worldly possessions. Here's a quick Top Ten for a life in the decade of SC&K. 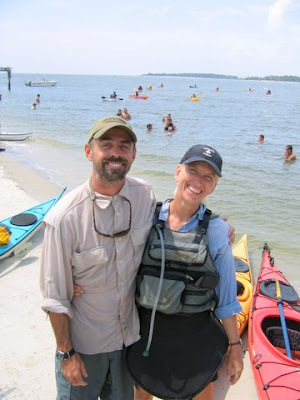 10/ Ten years ago we were in New Orleans half way through a grand 3000 mile canoe trip. "Wouldn't it be great if we could do this for a living" we thought. 9/ After almost two years living on Tybee Island and working for Dale at SKG, we bought a house on the east side of Savannah. 8/ After an eight month spell working for a state run 'Hoods in the Woods' program, Kristin says, "Maybe it's time you start your own guiding service?". SC&K is born. We borrow boats from friends on the way to the 'put in' to meet clients. For one class I borrowed Dave White's kayak and the client capsized a record 13 times. 7/ In a risky move Kristin leaves the Savannah Bee Company and joins SC&K full time. From now on 100% of our income would come from paddling. 7 seasons later we have close to 50 boats for sea, surf and river exploration. 6/ In 2005, Nigel joins the P&H sea kayak team, but unable to find a suitable boat of size and proportion, he leaves in 2006 and forms Team Savannah Canoe & Kayak. In Feb '06 we launch our on-line store. 5/ Jan '07. Our first shipment of Mega kayaks arrive heralding in a new branch at SC&K. We are now the No 1 dealer for Mega and have the best selection of surf kayaks available in the U.S. We have satisfied customers in Argentina, Mexico, The Bahamas, Senegal, Israel, Thailand, and New Zealand. 4/ Oct '08. 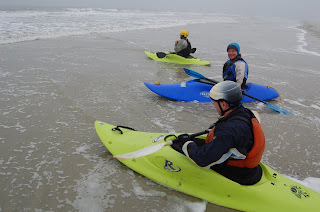 After several years of sometimes painful tutelage and training under various surf masters, Nigel is certified ACA Surf Kayak Instructor Trainer. 3/ April '09. Tiderace Kayaks arrive at SC&K. After many years of looking and waiting for a suitable production sea kayak, we think the Tiderace line suits the needs of competent and accomplished sea kayakers. 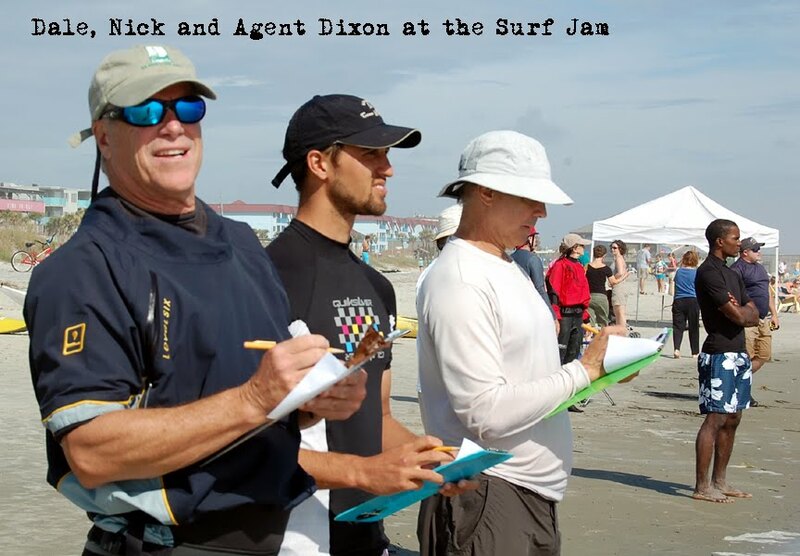 2/ The Tybee Surf Kayak Competition is resurrected as the Tybee Surf Paddle Jam, a fun-based event designed to introduce paddlers to competitive surfing. 1/ Dec 30th. Kristin spends a record 5.5 hours on the phone to technical support in the Philippines. 0/ Zero is the number of friends we have on Facebook. Pictures thanks to M.Robinson and R.Davis. Footnote: This is the 2001st Blog entry for 2009, giving us an average of 1 blog entry every 1.8 days. May all Beings be Happy, Be Peaceful, Be Liberated. 5/ Woolly Undies. Traditionally worn at sea, wool has been given a 21st century make over by the likes of Ibex, Icebreaker and Patagonia. Providing a great warmth to weight ratio, highly wicking and odour free it makes for a great base layer. Downside is it's not very hard wearing and the moths still love it. Check out the Ibex Runner shorts for men or women. 4/ 5 Star Surf Kayak Certification. After pursuing this award for three years, we now realise it ain't gonna happen. Since it's re-vamp several years ago, the BCU is still in a pickle and in our opinion, a non-starter in the U.S.
Now that the Brits have realised that a canoe is not a kayak, they are feverishly pushing that genre of the sport. Our advice... for kayaking, train in Britain and get certified in the U.S.
For canoeing, with Bob Foote and Karen Knight here, why go anywhere else? And for surf... who the hell needs a 5 star when you have Santa Cruz? 3/ Tiderace Xplore s in Carbon It's fast, it's hot and it's black and it costs a mere $5050. Tiderace continues to improve and advance the kayak construction business with well made, up to the minute techniques and design features. Aled Williams, the conceptualizer of Tiderace, is on a mission to produce the best open water sea kayak available on the market to date. Alas, his own carbon Xcite was stolen from his back yard earlier this year. If the price tag is a little high, why not go for the new Xtec Mega Boost. Weighing in at just under 20lbs you'll be carrying this sucker around town as a fashion accessory. 2/ 10 Day Spiritual retreat in India followed by two weeks R&R on the beach in Goa. This ain't gonna happen either, not this year. More likely, a work weekend at the Vipassana Center in Jessup followed by an afternoon canoe trip to Little Tybee. 1/ A new pair of back legs for Joey. He's been on the kayak scene for nearly ten years, has appeared in several kayak videos, the latest of which was Eastern Horizons, and he gets more well wishes than anybody else at SC&K. 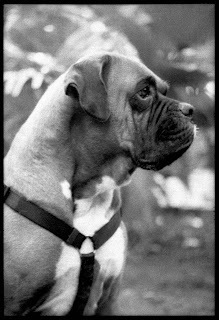 Joey the Boxer was rescued from a life of neglect and suffering, and has been a constant source of joy and entertainment ever since. In this last year he has showed quite quickly the signs of old age, most notably his wobbly hind quarters. He is currently undergoing extensive acupuncture treatments and extra ham slices. Merry Christmas to everybody. May all of your dreams be realized, may all beings be happy, may all beings be liberated. A Not So Merry Christmas 145 Years Ago. Sherman's army marched into Savannah on December 22. The next day, Sherman telegraphed President Lincoln with the message "I beg to present you as a Christmas-gift the city of Savannah, with one hundred and fifty heavy guns and plenty of ammunition, also about twenty-five thousand bales of cotton.."
1864.Sherman's "scorched earth" campaign began on November 15th when he cut the last telegraph wire that linked him to his superiors in the North. He left Atlanta in flames and pointed his army south. No word would be heard from him for the next five weeks. Unbeknownst to his enemy, Sherman's objective was the port of Savannah. His army of 65,000 cut a broad swath as it lumbered towards its destination. Plantations were burned, crops destroyed and stores of food pillaged. After a two week seige of Savannah, and fearing the destruction of the town, Confederate General Hardee withdrew his forces across the Savannah River on a hastily constructed pontoon bridge. It was the beginning of the end for the Confederacy. Sherman stayed in Savannah until the end of January. He set up temporary headquarters in the Green-Meldrin House which can be toured today. He then continued his scorched earth campaign through the Carolinas. Scientists have identified nearly a quarter of a million marine species to date, and 1,400 more are discovered every year. A decade ago, the world's leading ichthyologists, funded by the Alfred P. Sloan Foundation, embarked on a seemingly impossible task: to create a list of all known ocean species, showing where they live and how many of them exist. The Census of Marine Life (CoML) was born. 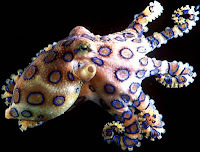 The project has swelled into a collaboration involving over 2,000 scientists from more than 80 nations that investigates marine inhabitants from the past, present and future, approximates how many of each species exist, where they live and the ocean's overall biodiversity. CoML will come to fruition on October 4, 2010, when the results will be made public at the Royal Institution of Great Britain in London. CoML scientists have built computer models to predict the future of the oceans' ecosystems, examining how biodiversity shrinks every year, when species will disappear if current rates of over-fishing continue, and when coral reefs may die out as a result of ocean acidification and climate change. Much of the research is done using newer technologies, including powerful sonar that can detect shrimp nearly two miles underwater, satellite tags that show tuna crossing the Pacific Ocean three times in less than a year, and DNA analysis that can rapidly monitor changes in the oceans' biodiversity. Scientists will use the findings to guide conservation policy and to help manage fisheries. Although CoML hasn't sparked any bills in the U.S., it has influenced the United Nations Convention on the Law of the Sea, the only legal framework that aims to protect the open ocean and deep sea. Before CoML, these laws were held back because of the lack of hard data, but now the information rolling in from the project is informing global legislative agendas. And it's working. As a direct result of the census, vast areas of the world's most vulnerable oceans have been closed to fishing. - B.B. And what a fantastic year it was...much love to the Ox. Here are some video highlights of the '09 season. A more comprehensive photo slide show will be coming soon. The dramatic loss of Arctic sea ice in recent years has created a fundamental new change in the atmospheric circulation in the Northern Hemisphere that has sped up sea ice loss and is affecting fall and winter weather across most of the Northern Hemisphere, according to several recent studies. Arctic sea ice loss peaks in September and October, exposing a large area of open water that heats the air above it. This extra heat has helped drive September - November air temperatures in the Arctic to 1°C (1.8°F) or more above average over about half of the depth of the lower atmosphere. This deep layer of warm air has grown less dense and expanded, pushing the top of the troposphere (the lower atmosphere) higher. The result has been a decrease in the pressure gradient (the difference in pressure) between the North Pole and mid-latitudes. With not as much difference in pressure to try and equalize, the jet stream has slowed down in the Arctic, creating a major change in the atmospheric circulation for the Northern Hemisphere. Arctic sea ice loss appears to have created a new atmospheric circulation pattern that brings more warm air in the Arctic, creating a positive feedback loop that causes even more sea ice loss. This feedback loop increases the likelihood that an ice-free Arctic in the summer will indeed come by 2030, as many Arctic experts are predicting. It's worth noting that such an atmospheric circulation shift was not predicted by the climate models. Indeed, the loss of Arctic sea ice over the past three years exceeds what any of our models were predicting. While we can rightly criticize these models for their inaccuracy, we should realize that they are just as capable of making errors not in our favor as they are of making errors in our favor. From Jeff Masters Weather Blog. Many surfers and surf watchers were already calling this year’s inaugural winter swells the biggest Hawaii surf they’d seen in decades. At Maui’s north shore Peahi Beach—more ominously known as “Jaws” by big wave riders for its massive winter surf—surfers yesterday boasted of riding swells of up to 50 feet from crest to trough. Over the weekend, weather forecasters had predicted similar wave heights for the North Shore of Oahu beginning yesterday. But by late Monday morning, wave heights at Sunset Beach and Waimea Bay—two of the most prominent surf spots along the North Shore—was peaking at 20 feet. 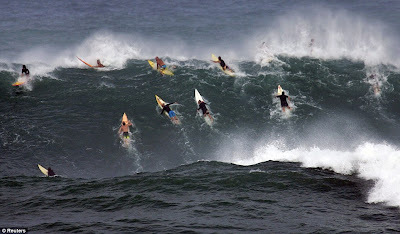 Waimea Bay swells (pictured here) eventually climbed to 25 to 35 feet Monday afternoon, but were kept from larger heights by choppy waters and strong northerly winds, which tend to break up larger waves. Many surfers and surf watchers were already calling this year’s inaugural winter swells the biggest Hawaii surf they’d seen in decades. At Maui’s north shore Peahi Beach—more ominously known as “Jaws” by big wave riders for its massive winter surf—surfers yesterday boasted of riding swells of up to 50 feet from crest to trough. Don Starkell - You Da Man !. It was Don Starkell who got us into this whole mess in the first place. I read his book 'Paddle To the Amazon' 15 years ago, while myself was on a planetary walk-about. 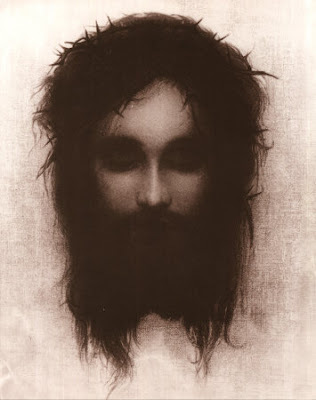 His determination and total abandonment of fear and all things earthly left a deep impression. I can't believe he is still slogging through the wilds on his quest for who knows what. But you have to admire his single mindedness/ madness. For some,there is only one path. Starkell accumulated many of the kilometers on lengthy expeditions such as the 1967 race from the Rockies to Montreal, a father and son canoe expedition from Winnipeg, Canada to Belem, Brazil, and a kayak adventure through the Northwest Passage. A daily 22-kilometer paddle, along the Red River and the Assiniboine River, has also added up. “Most days, he gets up at 2:45 a.m., leaves his East Kildonan home and hits the water by 4 a.m,” remarks Kives. “He has documented his paddles in a pair of hand-noted ledgers, one noting the distance paddled each day and the other noting the mileage he's racked up every year of his life since he paddled eight scant kilometres in 1945,” observes Kives. This summer, Starkell found it harder to paddle. Missing fingers, from a frostbite injury sustained on his 1991-92 Northwest Passage expedition, Starkell’s hand are prone to being cold. But at 76-years-old and with 64 years of adventurous paddling under your belt, it’s understandable. And despite everything, he keeps on going. Paddle To the Amazon By Don Starkell, makes a great Christmas gift. 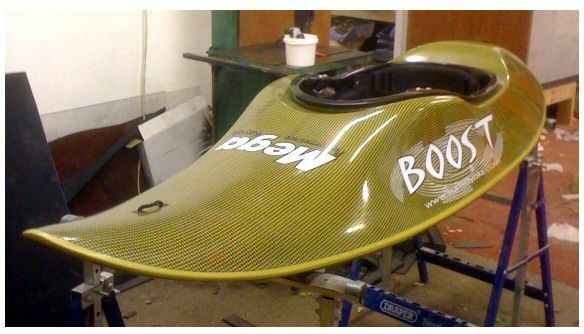 Give us a ring on 912 341 9502 if you want to try a Mega surf kayak. The conditions look favorable for a good 'try before you buy' session at the New Smyrna break. The chaps are back after a three day exploration of the island's beaches and waterways. Registered as a National Historic Landmark in 1970, St. Catherine's was a favorite hunting ground of the Indians. A settlement, called Guale, in the center of the island served as headquarters for their chief, also named Guale. The Guale were the last in a long line of Indians stretching back 4,000 years that appreciated the island's natural resources. Here, the Spanish also established a mission and garrison called Santa Catalina de Guale, from which the island takes it's name. Button Gwinnett, a signer of the Declaration of Independence, established a plantation on the island. After the Civil War, the capital of a black separatist sea island kingdom was established here. Please join the Ogeechee Audubon on Tuesday, December 8th, for their annual program and pot luck dinner. Diana Churchill, Ogeechee Audubon President, expert birder, and author of the 'Birder's Eye View' column for the Savannah Morning News will present a slide show on identifying ducks. They will also be selling books and gently used feeders donated by Wild Birds Unlimited. Proceeds will benefit the Ogeechee Audubon and Orphaned Bird Care. The Potluck Dinner is at 6:00 PM, followed by the program at 7:00 PM, and will be held at The First Presbyterian Church, 520 E. Washington Avenue, Savannah. The event is free and everyone is welcome. Bring your favorite dish, salad, or dessert to share with 8-10 people. Please coordinate the food dish you plan to bring by phoning Beth (912)598-1980 in advance of the meeting. Happy Holidays! A great kids' book for a great cause..
Lina Lukashevich has written a new children’s book to share her love of kayaking with the next generation of paddlers. 'Kayak Anna and the Palindrome Creek' is a splashing eco-adventure for readers ages 9 to 13. It’s a novel about a girl who cleans up the pollution of her neighborhood creek while learning about forgiveness, environmental activism and ravenous trolls! All profits from Kayak Anna are donated to Living Water International to provide safe, clean drinking water for children around the world. To purchase a copy for only $9.99, visit www.kayakanna.org or www.amazon.com . Thanks to the kind support and generosity of our customers we were able to pass on to Dan Lockwood over $1200 worth of paddling gear and cash. 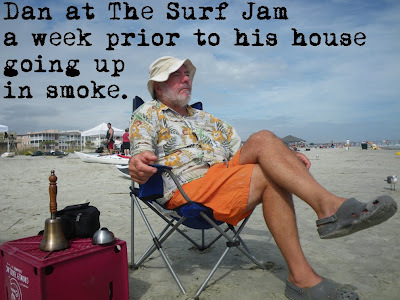 Dan L, an annual competitor in the Everglades Challenge lost almost everything when fire swept through his Tybee residence while he was out paddling on Little Tybee. 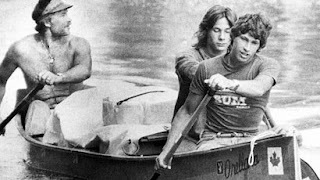 Dan had an eclectic collection of adventure kayaks and sailing canoes which he used in many locations around the planet. Dan gave a lecture here last year on his paddling and travelling philosophy. Only a week prior to the devastating blaze, Dan was the Time Keeper at our kayak surfing competition...Tybee Surf + Jam. We asked Dan what he needed most and he said "paddling gear". As well as a few sizable cash donations, we received Life jackets, spray skirts and paddle clothing. Dan is currently staying at Jim F's place on Tybee while he looks for a new place to live. A big 'Thanks' from Dan and us to the paddling community for your support when it's needed most. From Luke, one of our young sea kayak customers in the army who recently shipped out to Iraq. 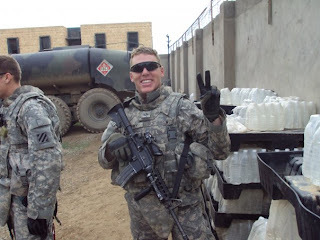 I figured it was about time for an update from Iraq, so here is the latest news. Things are going pretty well for us right now. We have been running the operations we will be running for the next few months for over a week now. We're slowly developing a routine for how things are going to run. For those of you who are still under the impression that the the war in Iraq is a gun fight on the streets, well, its not. We killed the dumb ones (those that thought they could defeat us in a straight gun fight) years ago. The "war" that we are waging now is against things like corruption in the government, police, Iraqi army. One of the primary missions that we have assumed control of is to try and crack down on corruption in a business here in our AO (area of operations). Details of which I cannot share, sorry. Granted occasionally guys are getting into firefights, and getting hit by IEDs, but for the most part Iraq is safe. However, our lives are still in danger, so please continue to pray for the protection and safety for all of us over here. My Thanksgiving wasn't bad at all. They served us a rather tasty meal of the traditional Thanksgiving affiliation. Turkey, ham, stuffing. The whole works, with exception of pumpkin pie. The meal was pretty good, but kind of strange. Everybody kind of sat there in silence, nothing really to talk about. I'm guessing we were all wishing we were back home with our family and loved ones. Not to fret, being separated from families is just another part of the job. Something that took me months to adjust to, but all is well now. I've adapted to being on my own and have learned to live with it. Iraq is most certainly a very foreign country. I've had the blessings to experience the cultures of a hand full of countries around the world, and Iraq is without a doubt the strangest and most foreign place I have ever been to. There is no semblance to western culture or thought here. The people are very withdrawn and keep to themselves, only concerning themselves in the affairs of their families, which are massive. They aren't friendly or open at all. No where near approachable, just to talk to someone we basically have to corner them. The women don't look you in the eye and the men are the only person you deal with. The thought of talking to an Iraqi woman is absurd. We aren't even allowed to look at them. The only smiling faces are the kids, but most of the time they are just looking for handouts or doing some reconnaissance for daddy bomb maker. The children here are the eyes and ears of our enemy. When we go to burn our trash the kids swarm us. They are all down there picking through the trash looking for food and throw aways. If we are heading out to burn trash I usually fill my vest with suckers and tootsies rolls. I get a little jostling from my platoon mates for being to friendly with the kids but I cant help my self. It breaks my heart when I look at them because the only thing I think about is how these children have known nothing but war their entire lives. Any child between the ages of 1 week to 13 years old, have known nothing but big scary white men with guns in their streets and homes. I appreciate all your thoughts and prayers, and your care packages. Christmas is just around the corner, so I'm just waiting for a wave of packages, because I know the folks back home are looking out for me during my time here. I love you all and can't wait to return home to share with you the memories and stories that will come out of this experience. We continue to implement our policy...all requests through the 'Off Season' months will be taken care of and receive the same quality of service as in the 'On Season'. There will be no slacking ! Therefore when two people want to kayak early Thanksgiving morning, and the elements are good, so be it. On the drive out, I pass a major utility work crew on the causeway replacing a telegraph pole. I get to Tybee and the lights are out. About 2pm last night somebody took out the pole in their truck. About six people have died on this road this year...all from very bad driving technique, not always their own. The young married couple on my tour are from India, but have been living/working in Atlanta for two years. It's a beautiful morning. Quiet and calm. They paddle very slowly, talking a lot to each other in Hindi or Urdu, not sure which. They do not see a dolphin deep dive 15 yards away. 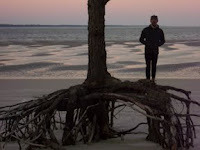 We take a walk on Little Tybee beach. They take photos of each other. I take a photo of them together. "Send this one to your mother", I tell them. We are all smiling and walking. They are from a small town outside Mumbai. "About 8 million." Small! As it turns out, we learn that we have both been to the same meditation school in India. They are a nice couple and really enjoyed the trip, as I did. Back at the ramp I meet a spiffy old geezer in a Nordkapp. He's with his wife, from Florida, and wanting some guide information. I oblige him. He is originally from Somerset, close to my home in Dorset, England. He came to the States in 1959... 50 years ago! "I'm 'fresh off the boat' with only 15 years", I reply. I tell him I can show him the best places for sand, surf, and scenery in 4 hours and that the tide looks good for tomorrow. They look like a cool couple to paddle with. Then a chap approaches and introduces himself to me...'Brian something'. He tells me his son just read our book after checking it out from the library. 'He loved it'. I tell Brian I hope it inspires his son to do the same. "I do too", he replies. Still at the ramp, I bump into Confederate Jerry. I hardly recognise him. He's grown a beard and looks somewhere between Kenny Rogers and Grandpa Clampit. Man, can Jerry talk....mostly about "them damn yankees." Carla and Jim, a local couple, show up. Carla is an Army Doctor. She was just about to be shipped out to Iraq, when during her physical exam they found a tumour in her jaw. They removed 4 inches of jaw bone and replaced it with titanium and bone tissue from her thigh. They did that three weeks ago and she looked great. She is now not going to Iraq and retires next year. We had a great turkey dinner at a friend's house this afternoon. We ate and laughed, but most of all we thanked each other, we thanked ourselves, and we thanked the universe for being so weird and wonderful. But really, just another day on this side of the globe. From Nigel & Kristin...A very happy Thanksgiving to all of our customers. You are all by far the best clients a business could have and we very much appreciate your continued and constant support. May we all spend more time paddling the beautiful waterways of our planet. May we all continue to enjoy the privileged and abundant lives that the Western world provides. May we all strive to improve the balance and harmony of those less fortunate. A Special Report on Paddlesports is based on extended analysis of data collected for the Outdoor Recreation Participation Report, produced annually by The Outdoor Foundation. The report uses the responses of over 40,000 Americans ages six and older captured in an on-line survey covering 114 different activities. The survey is the largest of its type examining participation in sports and outdoor activities. • 17.8 million Americans ages 6 and older participated in kayaking, canoeing, and rafting in 2008. • 9.9 million Americans participated in canoeing in 2008. 7.8 million Americans participated in kayaking and 4.7 million in rafting. • Paddling participants made 174 million outings in 2008, averaging 10 days per participant. Kayaking has enjoyed steady growth since 2006, climbing to 2.8 percent of Americans ages 6 and older in 2008. • Recreational kayaking is the most popular type of kayaking followed – by a significant margin – by sea/tour kayaking and whitewater kayaking. • 47 percent of kayakers get out 1 to 3 times per year. • Most kayakers live in states bordering the Atlantic and Pacific Ocean – the Middle Atlantic, South Atlantic and Pacific regions. Canoeing is the most popular type of paddling. 3.6 percent of Americans age 6 and older participated in canoeing in 2008. • Canoeing participants make an average of 7 outings per year. Despite the activities greater popularity, canoers make fewer annual outings than kayakers – 77.4 million compared to 69.5 million. • Geographically, most canoers – over 40 percent of all participants – are located in the East North Central and South Atlantic regions of the US, those states bordering the great Lakes and Atlantic Ocean. Friends and parents are the most influential in introducing paddlers to outdoor activities. • Relaxation is the top reason cited for participation in outdoor activities by kayakers and rafters while fun is the top reason cited among canoers. • A lack of time is the number one reason camping participants don’t get out more often. A lack of money for equipment is also a commonly cited reason. So there it is...it's now official. Canoeing and Kayaking is a contributing factor to the health and wellness of the American public. Paddling his shiney new Xcite, Paul Kuthe makes the Tiderace website. We are glad to see the Tiderace website continues to be maintained and updated as does the Tiderace U.S Team Paddlers Rostrum. As well as the young and the old with Paul K and Dale W (he's gonna kill me for that), it looks like we will be getting the 'good' in the shape of Sheri P and Turner W.
After paddling the Xplore S, Turner commented..
"It's the best kayak I have ever paddled that I did not make myself." Not sure what that means exactly, but knowing Turner, it's probably very good. And with his 'Moses Style' appearance he could take over the 'old' title from Dale. So, two spots open for 'bad' and 'ugly'. We would strongly push for Lil Nick Scovill, the winner of the Surf Jam - Sea Kayak division. He is ripping in just about anything in the surf zone these days. But alas, he is neither bad or ugly, but he is young and could maybe push Paul into the 'bad' category. Suggestions on a postcard for the 'Ugly' Tiderace team member. Must be hot as well as ugly. Photo proof required. Dave White above showing some secret love for Tiderace. New Tiderace models will be arriving at Savannah Canoe and Kayak in about two weeks time. Tiderace Classic Xcite and Xcite'S make great presents at $3650, and the Xplore, Xplore'S and Xplore X at a mere $3700. If you need anything else from NYC for Christmas drop it on a postcard. Talking of updated websites, we still wait with baited breath for the re-vamped Valley website. 'Any day now'... two weeks later and counting. Are we finally going to get the specs for the Valley Storm ? Will this be the kick in the P&H pants to get them to maintain and update their website also ? The Brits do hold themselves to a high standard, but they sure are slow on the uptake. One things for sure..It's all good for the customer. Lendal Paddles was recently acquired from Johnnson OD by Nigel Dennis. We could not get any answers from Nige about his plans for the company, but we think it's a positive move for the flailing Scottish classic. New Mega Boosts Here Soon. 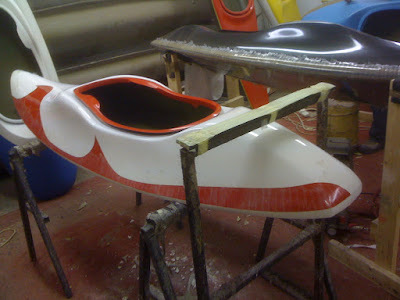 The latest offering form Mega Surf Kayaks International will be arriving at SC&K in January and Man, do they LOOK HOT!. The Boost is essentially the updated version of the very successful RV, but combines design characteristics of several other mega kayaks, particularly the Mega Merlin. The Boost will only be available in S lite and Xtec layups, both of which will be available at Savannah Canoe. "We loved the Merlin for how quickly it released in the tail atop the wave, and bottomed turned on the rail back up the wave. It looked so gosh, darn crazy with all that nose rocker. Absolutely punk ! A first class, dynamic, steep wave ripper. " said SC&K test pilot Flight Commander Johnny 'Ginger' Bigglesworth. So, basically what we will have from the Boost will be the excellent paddle out ability and very fast down the line speed of the RV combined with the very responsive tail movements similar to the Reflex and Merlin. Here's a quick first impression from Glyn Brackenbury. I recently got one for my fourteen year old son, he's mumbled some teenage words which I didn't understand but the general jist was that it's brilliant. . It's got a lower cockpit profile so you can really crank over into a turn without dragging your knee in the wave face. If it's the right size for you it's a really great boat. Of course, there is way more to it that, so you had better sign up for one of our demo sessions in Tybee and Florida this winter. Dates and locations to be announced soon. Boats are avialable to reserve now for delivery in January. $2250 for S lite. Red and White. And All Black. $2550 Xtec - No Gel Coat. Europe's first artificial surf reef is days away from completion, tourism chiefs in Dorset have confirmed. It is due to be the jewel in the crown of a multi-million pound project to rebrand a less than glamorous part of the Dorset coast. The reef, off Boscombe, in Bournemouth, will aim to improve surf conditions in a project which cost £3m - nearly double the original price. The reef is part of an £11m ongoing regeneration of Boscombe's seafront. The council hopes the regeneration will boost the economy by £3m a year and that the underwater construction will attract up to 10,000 surfers. The reef has been built with 55 sand-filled "geotextile bags", which will cover an area the size of a football pitch underwater. 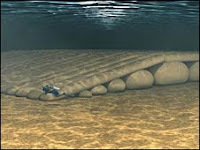 It will be one of a number of similar artificial reefs of its type worldwide, including developments in Narrowneck, Queensland, Western Australia and Mount Maunganui, New Zealand. Red Bay Trees Losing Battle. 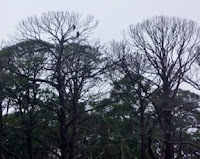 Mortality of red bay trees (Persea borbonia) in coastal locations in South Carolina, Georgia and Florida is spreading rapidly, resulting in the death of nearly all red bays and sassafras trees in the infected areas. The cause of the disease is a fungus (Ophiostoma sp.) vectored by an Asian ambrosia beetle (Xyleborus glabratus). Both the beetle and fungus are recent introductions into the United States. At the present time, there is no known method to halt the spread of this disease. The Beetle was first discovered in palets at Port Wentworth, Savannah, back in 2003 and probably came from China or Thailand. Just before Steve and myself reached Cumberland Island earlier this month, rangers and forestry workers had been out on the island collecting Red Bay seeds for the Federal Seed Bank. This is not a good sign as is means there is nothing that can be done to stop the spread of this deadly disease. Red bay trees extend from Virginia to Louisiana on the coastal plain. A member of the laurel (Lauraceae) family, it is closely related to swamp bays and silk bays.Also in the Lauraceae family are: 1. pondspice (Litsea aestivalis); 2. avocados; 3. sassafras; and 4. pondberry or southern spicebush (Lindera melissifolia), a federally endangered species. Currently red bays and sassafras are confirmed to be susceptible to this wilt disease. It is unclear if other members of the laurel family can serve as hosts to this disease. Since it is suspected that several members of the family may be impacted, the proposed name for the disease is “Laurel Wilt Disease”. Red bays have limited commercial use. The wood is sometimes used in cabinetry and boat building and the trees are occasionally used in landscaping. The seeds of red bay are eaten by turkeys, quail, deer, songbirds and bears. Leaves are used in Southern cooking to flavor gumbos. Red bays are host plants to three butterflies: palamedes, Schaus and spicebush swallowtails. The palamedes is obligate to the red bay as the eggs are laid on the leaves and the emerging caterpillar eats the leaves. The disease continues to spread unabated. A lecture by Dr Paul Fleischman, Psychiatrist and Author. Tuesday, November 17th @ 6pm - The Morris Center, 10 E Broad, Sav. FREE. During the 20th century, revolutions in physics and biology transformed our vision of the world and of ourselves, creating increased insight into the scientific basis for Vipassana Meditation practice....a practice for living a balanced life through a technique originally taught by Gotema the Bhudda. Meditation has gone from unknown, to wildly popular in the Western Hemisphere in only about thirty years. (In contrast, it has been well known in India for about two thousand five hundred years.) This has led to confusion about what meditation really is, how it works, and in what ways it helps people. Vipassana Meditation is an ancient, non-sectarian Indian technique that was designed to guide a realistic and compassionate lifestyle. Western science rocketed forward in the Twentieth Century, describing a testable vision of reality that reaches from minute electron-probability waves, to the Big Bang, from the evolution of DNA as the basis of biological information, to the hubbub of metabolic interactions within each living cell. The new scientific narratives provide increased understanding of the realizations that informed the discovery of Vipassana, why it practiced as it is, and how it helps people. Vipassana focuses on neutral, systematic, evidence-based observation of oneself as a changing process in a lawful universe. It catalyzes realistic experiences from which one can steer both a practical and profound life. Vipassana is not primarily a healing technique, but a window into multiple dimensions within our selves. Meditation is intended to be a mirror of conduct, to lessen attachment to narrow perspectives, and to align our selves with reality as it is, in order to live a more harmonious and contributory life. Based upon the guided curriculum designed by Mr. S.N. Goenka, of Igatpuri, India, Vipassana is taught for free, on a voluntary donation basis, in ten-day residential courses, in scores of meditation centers around the world. Approximately one million students have successfully completed these courses. Vipassana Teachers also teach for free, and the practice is not connected to any profession, or treatment. Click the 'Dhamma' link on the left to find out more about courses in this area. Thanks again to everyone who came out and supported this event, even the sympo sea kayakers, who had no concept of the 'competition zone'. Overall it was a great day at the beach with surfing, fishing and kayaking all going off. If you were from out of town that day you really would think that Tybee was the healthiest town on the east coast...hey, for some of us, it is. Kristin: So, tell us, Nigel, in your opinion, what was the highlight of your trip? Nigel: Apart from the weather and the great changing scenery on my right side, paddling across the Altamaha delta was a treat. It seemed to lie in the middle, an equal distance from nowhere as real Georgia Coast back country. The delta consists of a very changeable area, strong currents, huge amounts of sand deposits, lots of accretion and great geomorphology. Kristin: Was that day then your favorite day? Nigel: My favorite day was the second day. We left Beach Hammock and crossed three sounds. The wind had been steady out of the Northeast for several days already. The boats were fully loaded and the decks were awash as we went surfing past empty beaches under grey skies. Kristin: Was there any thing in particular about the journey that you found disappointing? Nigel: No.It was the best trip of the year. We will do it again next year. Kristin: No? What did you do with my husband? And which island then was your favorite for natural beauty? Nigel: Seeing the frontside of St. Catherine's was another highlight of the trip. It has a mysterious feel to it.. in addition to being shrouded in fog for half of the day. It seems to be the most unreachable and private of the islands. Nobody really knows what happens there. Kristin: How about something else more tangible that came as a surprise to you? Nigel: That would be a shipwreck that we came upon on the beach of Little St. Simon's Island. It was a tug boat and looked like something straight out of a movie, something for Captain Jack Sparrow. Kristin: Did you come to especially appreciate any pieces of gear? Nigel: Yes, my boat and my paddle. I paddled the Tiderace Explore S. At 17.6 feet long it was fast and excellent for such a trip. I also stayed dry in the boat every day which came as a real blessing. All the hatches were completely dry also. I used my Greenland paddle, which proved a great choice for such a trip. It allowed me to alter my stance as needed each day, for instance by altering the length and depth of each stroke. This can be very useful as the sea states change and as your fatigue level changes. Lastly I am also glad that I took along my secret weapon, the C-Tug kayak cart. It was very handy for transporting heavy boats to and from the campsites. Kristin: Lucky you. How come we didn't have one of those on our canoe trip? Kristin: What then would you have done differently? Nigel: Not much, it was a good plan. I wouldn't have carried quite as much water and definitely more milk for tea. I brought 17 liters which lasted until Cumberland. I could have refilled on Sapelo which would have helped to lighten my load. I also would have carried more chocolate. No, more chocolate cookies to be exact. I had those Ginger Snaps. Them Ginger Snaps made me mad! Several times I thought to myself, "These damn Ginger Snaps are driving me crazy!" Kristin: Guess I better ask for the hardest day as well..? Nigel: That would have been Day 3...Halloween. After a long second day, the wind kicked around to the West, then South. It was foggy, then hot. At the end, the take out was at Cabretta, which was difficult. There was a group of witches from Atlanta at the campground who did not want us there. It was a tiresome day. 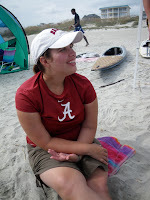 Kristin: All and all it sounds like a fantastic experience paddling and camping along some breathtaking coastline. Nigel: I'd say so. Yep. A fantastic bit of the coast of the U.S. What's for dinner? You may know that every year I attend as many of the SCAD Film Festival showings as I can. This morning I saw a truly great environmental documentary named "So Right, So Smart." 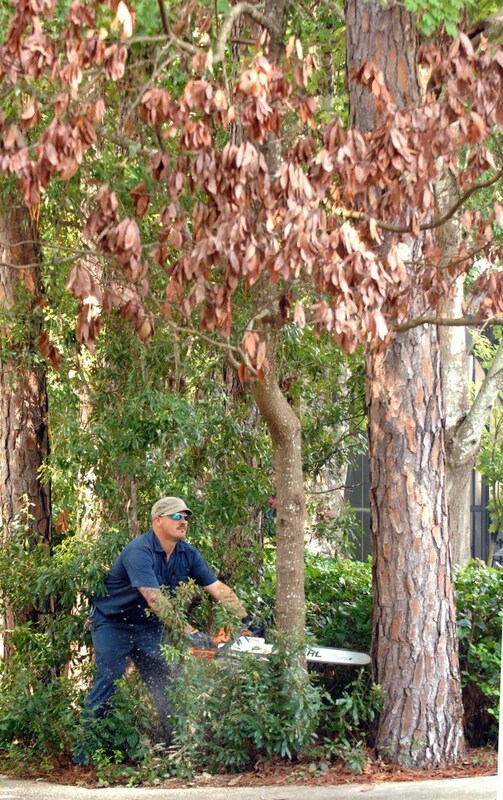 The SCAD program describes it as "As environmental awareness increases in customers, business leaders like Ray Anderson are learning that sustainability is an ethical imperative for the future; in the process, they're finding that money just might grow on trees." The SCAD description doen't do the movie justice. Ray Anderson ran a carpet square company and had an environmental epithany that he could do the right thing and still make money. He did and is spreading the word throughout the business world. This is the company that laid a pipeline from the land fill to their factory in La Grange to capture and use the methane gas. Every environmentalist in Georgia paticularly should know about this guy. Most environmental documentaries start off telling you how the bad guys are polluting, nobody is stopping them and you leave the theater depressed. With this one I left the theater feeling good. I spoke to the director in the lobby. The movie will be shown again at the Lucas on Thursday at 2:30. I encourage you to come see it. If you have somethng else planned, reschedule or cancel it. Take a few hours off work. You will not regret it. I'd love for our environmental community to be able to see this at perhaps our only opportunity. Cumberland! The Eagles Have Landed. 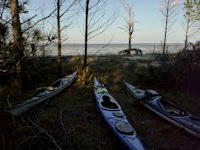 Update from the field... Nigel and Steve paddled 16 miles Monday, leaving from the north end of Jekyll and arriving on the north end of Cumberland Island. Cumberland is the final island in the chain of Georgia's barrier islands and marks the end of their coastal journey. They will spend 3 days exploring Cumberland.. camping first at Brick Hill Bluff Monday and then paddling southward 11 miles to set up at Sea Camp for Tuesday and Wednesday. Breaking news... Nigel has found the snack bag! (amazing what a person can lose in the bow of their boat!) Thursday morning will be the last paddle of the 8 day expedition.. 6.5 miles back to St. Mary's for the unload and pick up. With 110 miles under their belts and a smile on their faces, I'm sure it will be a bitter sweet finale. Well done. Donations to assist Dan and his family can be sent to us here at SC&K. We'll make sure he gets them. Specifically Dan has asked for any old paddling gear, and also for some old bicycles for his kids - Sammy (age 11) and Jesse (a tall 13). Thanks to the paddling community for coming together on this one. Our dear friends, Dan Lockwood and family, suffered a terrible loss yesterday as a fire destroyed their home on Tybee Island. Please keep them in your thoughts and prayers. We will post a location to send any donations as soon as we hear. 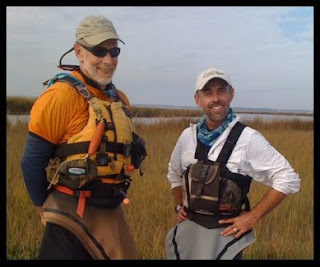 Update on the 2009 Georgia Coast Expedition..
Nigel and Steve are doing well, arriving on Jekyll Island today a full day ahead of schedule. 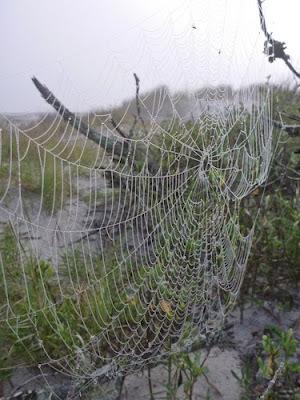 Nigel reported that yesterday proved to be a long day... a thick fog and southerly wind set in as they paddled 13 miles from St. Catherine's Island to Sapelo Island. 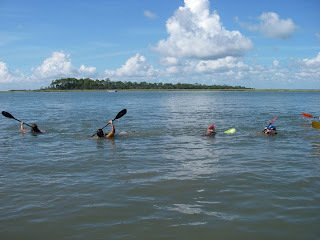 Today's paddle was 22 miles, crossing through the mouth of the Altamaha River and sandbars of Little St. Simon's, through St. Simon's Sound to the north end of Jekyll. Although it was longer in distance, they were blessed with light west winds and smooth seas. As for tomorrow, it will be 6 miles along Jekyll, 5 miles crossing over to the last of the barrier islands, Cumberland, followed by 4 miles to the Brick Hill Bluff campsite, for a total of 15. Let's all hope for a northern blow to push them along! Well done, boys... one more to go. Bon Voyage, Steve and Nigel! 3rd - Ted Williams & Kay Hess. We have a lot of pictures and video that will be added to the website as soon as we get the chance. We will be compiling a dvd of the event that will be available to purchase for a small fee. Thanks again to all who took part and the volunteers who made it run so smoothly. Also thank you to those that came out to spectate and cheer! Surf Jam was Right On ! 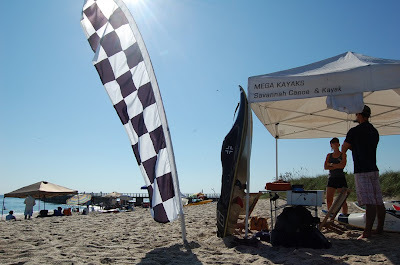 A big thank you to everyone involved with the First SC&K Tybee Paddle Surf Jam. You all made it a great day at the beach and showed off the sport of paddle surfing to it's very best. We would also like to thank the Tybee board surfing community for giving us a great piece of the beach on a 'top 20' Tybee surf day. I don't think we had one board surfer in the competition zone....a few confused sea kayakers perhaps, but that was o.k too. Full results and pictures will be added here, and to the Surf Jam web page on our site. "Please congratulate yourselves for a fine job. The volunteers were fantastic, positive, and just a delight. " Conditions look very favorable for a fun and exciting contest. Greys Reef buoy is bobbing around at 4ft with a 7 sec period at present. Winds will decrease somewhat for Saturday but stay southerly, wave height will decrease, extending the wave period slightly and cleaning up the waves. This is a near perfect forecast for this event which is really aimed at introducing paddlers to competition surf as a way of improving skill level and continued enjoyment of the sport. We have twenty three contestants for the jam. If you are not signed up we will see you next year. Registration is now closed... there are no walk ups. L3/L4 Surf Kayak class this morning at 9am....also full . Old students are welcome to join us. Dan and Bethany are paddling the 'Ditch' from Maine to Florida. 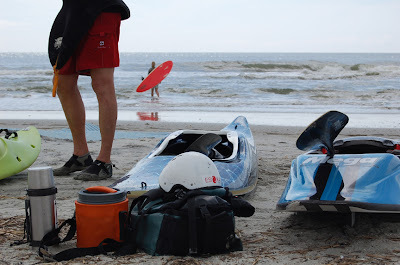 We got an email from them a few days ago looking for paddling and logistics info regarding the Ga coast. We were more than happy to oblige. Almost 10 years ago to the day a similar young couple were just starting out on a through paddle from Wisconsin to Florida (sound familiar). Although we never emailed anyone, we did receive a lot of assistance from strangers along the way and it did make the trip all the more interesting. The intrepid couple are on Tybee for a few days before taking on the challenge of the Ga coast. We wish them a bon voyage. What do a beach, a dune, a freshwater swale, a maritime forest and a saltmarsh all have in common? The answer?...They are all components of the wonderful area we know as the Georgia coast and barrier islands. 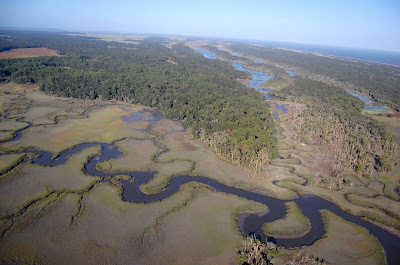 To understand how our coast was formed, what forces affect it, and how its diverse habitats influence the wildlife that live there, please join Ogeechee Audubon on Tuesday, October 20, for a presentation by John "Crawfish" Crawford. John is a highly knowledgeable and entertaining speaker with a wealth of information and tales to share. He is a Marine Science Education Specialist at the Skidaway Island Marine Extension Service, part of the University of Georgia. His talk and slide show are entitled "A Dynamic Stability: The Nature of the Georgia Coastal Region." The program begins at 7:00 PM on Tuesday, October 20 at the First Presbyterian Church, 520 E. Washington Avenue. No reservations are necessary and the program is free and open to the public. 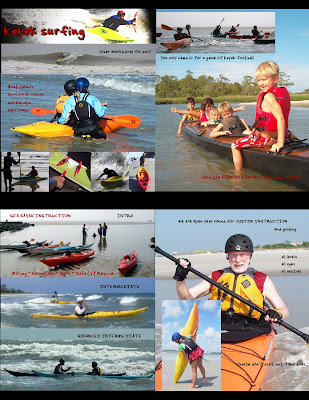 Savannah Canoe and Kayak has the complete range of plastic and composite contemporary mega surf boats. There will be a few demo and display models at the beach this weekend. See you at the Jam ! With water temps in the high 70's, the Tybee Paddle surf Jam, back by popular demand, is gearing up nicely. We have approx 15 people signed up at present with a week still to go before registration closes next Thursday. 20 Contestants would be ideal. It's excellent to see that the largest category is the First Timers. This is just what we hoped for as the purpose of the event is to introduce people to competition surfing as another way to increase skill level and enjoyment of a great beach based activity.
" It would be great to fill the beach with an assortment of kayaks of all lengths, sizes and styles." said an SC&K authorized spokesperson. "We got the new Flex from Venture which looks like a heap of fun in waves. The Tandem event should be a good crowd pleaser with father and son, husband and wife, cop and con combos, all on Malibu 2's. The Mega Bullitt X's will also be making it's first U.S appearance. And the Tiderace Sea Kayak line will also be on display and surfed in the competition." And what about the conditions ? 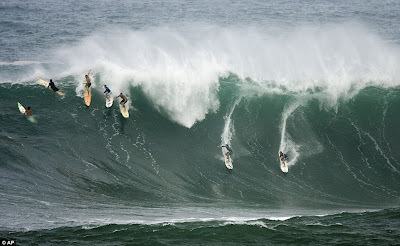 "Well, October is a commonly good month for waves. If it's big and rowdy there will be great displays by the 'Pros' and if it's flat we will have kayak races to the buoy and back." 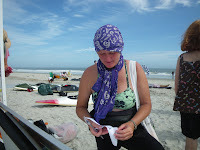 One way or another, we have a beach, ocean people and kayaks, plus a few goodies to give away. So, come on down to the beach, bring the family and your swimming suits...there's gonna be a jam. On the 31st of October we will depart on a kayak trip that will take us along the front of all 13 of Georgia's barrier islands. On this coast, the dominant natural force is the tide. Like a heart pumping blood through the body's vital organs, Georgia's tides pump a tremendous volume of water in and around the barrier island, into the sounds, and the marshlands. Life has adapted to and become dependent on this natural process in ways great and small. For 10 days we shall become a part of that process. We took to the sky's this afternoon and scouted out the first three islands of our coastal trip coming up in November. We buzzed along empty beaches at 50ft and 100mph on a glorious Fall afternoon. 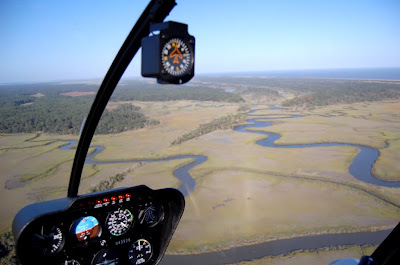 Ossabaw was incredible at 500ft and it's sloughs were chock full of big gators. 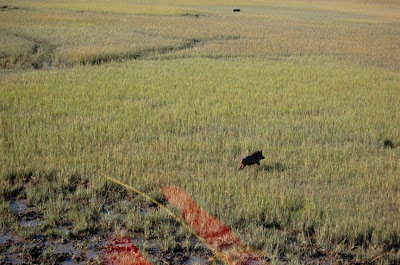 As we flushed wild hogs from the marsh it was almost like being in Africa. Our coastal trip will launch in three weeks and we are very excited about the adventure ahead. Registration has now closed. Excitement for the Paddle Surf Jam on October 24th is growing as spaces fill up. We already have a decent number of contestants coming from Florida, Georgia, South Carolina and Delaware. First Timers is the biggest category so far with over 10 newcomers eager to jam. The Sea Kayak class is also getting a lot of interest, but only three signed up for that as yet. We currently have 4 teams for the Doubles event . 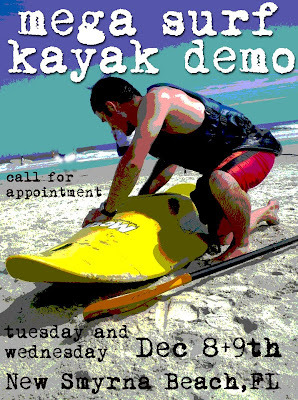 * Surf Kayak classes and demos all week prior to the event. Tiderace Sea Kayak Demos all week prior to, and one day after, the event. *'Boat check in' is now at 8am with a start time of 9am. *Lunch will be provided for all contestants. *The Old Bastards age minimum has been dropped 5 years to 50, to include people who we thought were older bastards than they actually are. *The new Mega Bullitt X, the first one in the USA, will be on show at the beach. *Still looking for a couple of judges. Keep a check on the website Surf Jam page for new updates. There will be more changes coming so ...keep this frequency clear. SC&K Paddler in Top Six at Nationals. 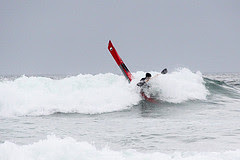 Poor conditions made for a very tough competition at the U.S Waveski National event this weekend. Riders from far and wide came out in force, and the caliber was high with such prominaries as Matthieu Barbarit and Caroline Angibaud, Tyler Lauston , Fletcher Burton and Nick Scoville. Nick Scoville did you say ?. Yes, that's right, our very own 'Snakebite' Scoville was in the top six as the 30 competitors were slowly whittled down to crown a nations champ in the art of ski surfing. Alas, the Surf Gods were not satisfied with $125 entry fee and the comp was cancelled on the first day due to none-rideable conditions. 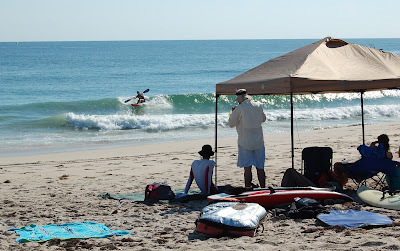 Friday was gorgeous and kicked up a 1.5 ft swell which tickled pink the organizers with some two footers breaking clean onto the Florida shore. Lunch was cancelled and 20 heats were run. 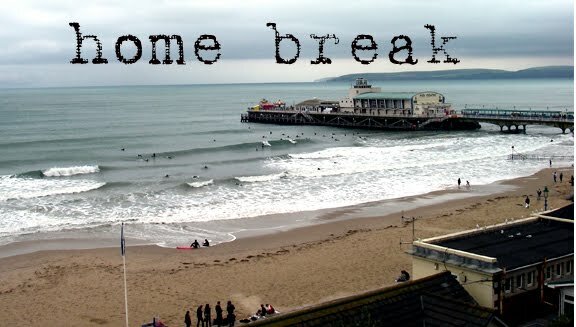 Short and quick, boards and rides, was the order of the day along with a few cracks, dings and face plants in the sand. Mattiue Barbarit...the 5 times world champ from France. Congrats dude. And very well done to Nick S...showing once again some of the best paddling talent comes from a very small island on the east coast not known for it's great surf....Shhh. say no more ! Ogeechee Audubon and the Carolina Butterfly Society are co-sponsoring a field trip this Saturday, October 3, to look for birds and butterflies in nearby Jasper County, SC. In the event of rain, the trip will reschedule for Sunday, Oct. 4. The focus of the trip will be Tillman Sand Ridge Heritage Preserve, a wonderful and rare habitat of long-leaf pine, wiregrass and relict sand dunes. Bob-white quail and Bachman's sparrows love this area, as do many uncommon species of butterflies. The group will then move on to Savannah National Wildlife Refuge, where the hardwood hammocks scattered amid the fresh water marshes serve as "migrant traps" this time of year to concentrate southbound songbirds. Our leaders will be Dennis Forsythe and Tim Miller, both accomplished birders and butterfliers. Bring water, lunch or snacks, sun and insect protection, and binoculars. A field guide and close-focusing binoculars (for butterflies) are also recommended. Meet at 9:30 AM at the junction of highways 321 and 336 in Tillman, SC, about 14 miles north of Hardeeville, SC. There is a small convenience store at the intersection where the group will assemble. For more information, please contact Tim Miller at 912-429-2700. On a different, but related note, please click the link below to read an article that makes a persuasive argument on why we should not let our pet cats roam free in our neighborhoods! Congratulations to long time SC&K customers Sarah and Rick who married last evening. Savannah's Telfair Museum served as a beautiful backdrop with it's paintings and sculptures providing grandeur to the event. It was a very sophisticated affair, with accompanying violin and harp ensemble and a veritable who's who of Savannah Arts patrons. 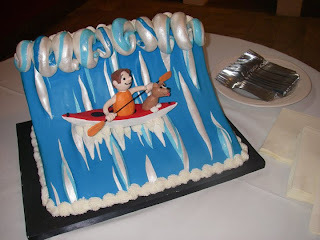 But wait.. is that a kayak cake we see amongst the splendor?? The newlyweds are off to Puerto Rico for some paddling in the bio-luminescent bays. Here's to ya! Half Off Week Now Over. Most takers were signing up for the intro class, and the deal brought in those who may not of otherwise taken instruction. And for those procrastinator fence sitters as well, this was their motivation. Our 80' water is going to start cooling off pretty quickly...especially with 15" of rain water runoff heading this way. We will be offering another cut price session in the winter. We will also be holding some pool rolling classes and practice sessions. As you can see, students taking the half price classes were not given kayaks. They actually progressed much quicker. No, not really. Everybody got their own kayak.